When we woke up this morning, it was still raining. At breakfast, we sat with an older couple from London that we met the evening before at dinner. They were also hoping to hike to Tiger’s Nest today. By the time breakfast was over, the rain had stopped. We went ahead and got ready for a hike, hoping that the weather would hold. At 8 am we went to the lobby and Pema and Ugyen showed up shortly. We decided to attempt the hike. We had to hike to the car down the flooded road. A lot of the water was gone, but it was a bit of a muddy mess. When we got down to the car, the portion of the road that we still had to drive actually looked worse. The problem was that with all the water, it was difficult to see where the rocks were. It was a little iffy, but we managed to make it down to the main road. The riverbanks were overflowing and there was water everywhere. We reached the starting point for the hike just before 9:00 am and Pema told us that Ugyen would be coming along and he took my backpack. That helped a lot because my back was a little sore this morning. I live in fear of re-injuring it. We took off and it started raining again, but lightly. I asked what the distance of the entire hike was, but Pema said they never measured it by distance – just by the time it takes to hike it. He said it was about three hours up and two hours back down. I knew at my pace, it would be slower than that. I know everyone was a bit worried because I couldn’t do the Cheri Monastery hike the week before, but I knew it was because of the food poisoning. Being a bit out of shape, having a bad back, and bad knees slows me down, but it doesn’t stop me. It took us just over an hour to reach the first stopping point, the teahouse. We stopped and had a cup of tea and biscuits. There is supposed to be a spectacular view of Taktsang Monastery (Tiger’s Nest) from the teahouse, but everything was mostly misted over. Stephen, Kara, Pema and Ugyen on the hike to Tiger's Nest. Then we headed off to the second viewpoint. It was muddy in spots and steep in others, so it was slow going. In one place, part of the trail had slid down the mountain, so there was only a narrow space for us to walk. It took us another hour to get to the second viewpoint, and it was still fairly misty around the Tiger’s Nest, although we could now see the valley. The next part was the section I was dreading. It was hundreds of steps down, then back up to the monastery. I had a walking stick, but it was still pretty hard on my knees. Right before we got to the stairs leading back up to the monastery, we had to cross a bridge in front of a big waterfall. Although the rain had completely stopped, we got soaking wet again. I struggled up the steps and we finally made it to the Tiger’s Nest. We went into the first of two prayer halls and received a blessing. We didn’t stay very long, as the monastery would be closed from 12 to 1 for lunch. We headed back down the steps. I couldn’t wait until we climbed back up to the second viewpoint, because it would be all downhill after that. At the second viewpoint, Stephen was finally able to get some clear shots of the monastery. We stopped at the teahouse for lunch, then finished the hike. We got back down to the car a little after 3:00 pm. After that, we went into Paro to do a little bit of gift shopping. It only took about a half hour and then we headed back out to the hotel to relax before dinner. We were quite happy to be staying in a hotel tonight instead of a farmhouse so we were able to shower. At dinner, Pema received a fax for a revised schedule for Druk Air Flights on the following day. Because they added some extra flights to make up for the days they couldn’t fly, our 10:15 am flight had been delayed to 4:50 pm, with a stop in Calcutta. Instead of reaching Bangkok at about 4 pm, we will get there at 10:05 pm. Our plane leaving Bangkok for Tokyo leaves at 7:00 am the next morning, so we will just have enough time to sleep by the time we get through immigration and to the hotel. We’ll just have to do our relaxing in Paro, sans internet. I would feel better if we had a little more time before our flight to Bangkok in case there are any more delays. At least we decided we could wait to pack until the morning. 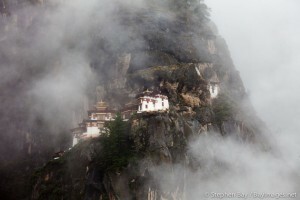 Thanks so much for your detailed description of this hike up to Taktsang. I am considering a trip to Sikkim and Bhutan in October of this year with a yoga group. I am worried about this one part, as I am a62 years old, about 60 pounds overweight (am trying to lose some between now and then! ), have both osteo- and rheumatoid arthritis, and not such great knees and feet! I also am not very fond of heights. Having said all that, it seems crazy to go to Bhutan and NOT attempt this! Did you feel you needed actual hiking boots for this, as opposed to just walking shoes? Also, I am considering bringing trekking poles along on the whole trip, and wonder if you have any experience with these or might recommend them? If you can answer, it would be much appreciated. In any case, thanks for your wonderful photo and description! The Tiger’s Nest was an amazing part of our visit to Bhutan, but I would definitely say that our trip would have been worth it, even if we had skipped Tiger’s Nest. We nearly had to skip it because of the weather. My husband and I both just wore our regular athletic shoes when we did this hike, so that definitely wasn’t a problem. Two thirds of the hike is mostly just switchbacks on a steep dirt path. The part of the hike that is the most difficult is the stairs. I don’t have much cartilage left between the patella and femur, so I intensely dislike stairs and these stairs are fairly challenging. They were more challenging than the stairs on the Inca Trail, although at least there are far fewer steps to Tiger’s Nest. Some people go to the lookout straight across from the Tiger’s Nest right before the stairs, then don’t do the stairs portion. This is still an amazing hike, even if you stop there. I am 42, and I saw many people much older than I conquering this hike with no problems. I was probably 40-60 pounds overweight when I did it, and I definitely would have an easier time if I did it today, at around 30 lbs lighter. Downhill is much harder on the knees than the uphill. Personally, I’d say it is worth giving it a try. But if you have problems, there is no shame in deciding it is safer to turn back. I had to turn back on a hike a few days before this one because I was still suffering the effects of food poisoning from the evening before. If you listen to your body, you should be fine. I doubt you will have trouble making it to the lookout across from Tiger’s Nest. But you have to decide how you feel about steep stairs and whether you want to do that portion of the hike. I would have LOVED to have skipped those awful stairs, but I’m glad I decided to go ahead and try it. I just never rush myself. I go as slow as I need to go and let people pass me if they are in a bigger hurry than me. I take my time and enjoy the scenery. Good luck! I am sure if you decide to make the trip, you will have a fantastic time, whether or not you decide to include the Tiger’s Nest hike. 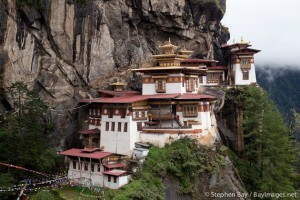 I’m going to Bhutan next year and I have a pretty serious fear of heights. I would really like to hike up to the monastery. Since you’ve hiked the Inca Trail, you might be able to compare for me. I had absolutely no problem hiking from Machu Picchu up to the Sun Gate/Intipunku. There was a tiny part right near the top that was a little dicey, but okay. Can you compare the two trails in terms of drop-off at the edge? How wide are the paths? If I slip on the steps, am I going to go tumbling off to my death? How were the bridges along the way? I am seriously scared of heights as well, but I try to force myself to overcome it as much as possible, with mixed results. I’ve definitely done scarier things than hiking to the Tiger’s Nest. As I recall, there is just one bridge on the way to the Tiger’s Nest, and you kind of have to run across it because of the waterfall (or you will get soaking wet), but it is a reasonably wide bridge and I didn’t find it very scary. For me, the most difficult part is the steps. There often isn’t any railing, and I am just as scared of falling down the steps as I am of falling over the edge, and it is much more likely that one might fall down the steps. I have bad knees and go pretty slow, so when people needed to pass me, it was a little nerve-racking. I just always tried to stay to the inside. But because I go so slow, I feel like I am pretty safe. The first two parts of the hike, which were up dirt trails through the woods, were just fine, except for one little spot that was narrow and near an edge. It was bad when we were there, because part of the trail had washed away and you kind of had to jump, but other than that, there was nothing to worry about on that portion of the hike. If you get up to the lookout right before the steps and then decide you just don’t want to try the stairs, the view of the Tiger’s Nest from that spot is pretty amazing. You’ll get the most spectacular view from there, unless it is misty. The main reason to finish the hike is if you want to see the inside of the temple, and believe me, you will see the insides of PLENTY of temples in Bhutan. The other reason, which is the one that worked for me, is for the challenge and because I wouldn’t be able to forgive myself if I went all the way to Bhutan and didn’t hike all the way to the Tiger’s Nest. The only hike I didn’t complete on that trip was the one to Cheri Monastery, and that was due to food poisoning. I’ve done several things I thought were a lot more frightening than the stairs on the Tiger’s Nest hike. I did suspension bridge hikes among the rainforest trees in the Peruvian Amazon and in Costa Rica. Going up in the CN Tower in Toronto and the N Seoul Tower on Namsan Mountain in Seoul was not so fun for me. I hope that helps at least a little. For me, if I REALLY want to do something, I just that desire dictate what I do and try not to worry about the heights. You’ll never catch me bungee jumping or skydiving, but other than that, I might be willing to try something that involves heights. There’s a treehouse hotel in Laos that I really want to visit, because my desire to see monkeys is stronger than my desire to stay on the ground. Very interesting journal re your trip to Bhutan in 2009. I have booked my trip with Chimmi of Village Tours and Treks for October this year. I am really looking forward to this trip. 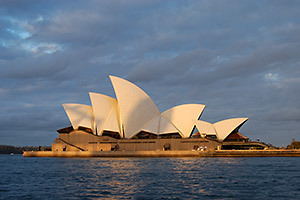 Do you recall when you made the final payment (i.e., 1 month before the trip or earlier)? I sent Chimmi a couple of e-mails but still don’t have a reply. He has confirmed the flight Bangkok/Paro/Bangkok, as well as an itinerary during my stay back in July. I have wired the air ticket payment to him in July. As October is fast approaching, really want to finalize this trip soon. I would welcome any information that you can share. we are a family of three and we are planning to visit the tiger nest monastry next may.I need help with the permission to get into the monastry.You guys seem to have managed it.Also can you recommend any reliable guides for the trip? Thanks.